More Personal Attention When Buying or Building a New Home. For Current Rate Quotes, Call 806-472-4439 during regular business hours. Monday-Friday, 8:00AM-5:00PM. Click here to prequalify. 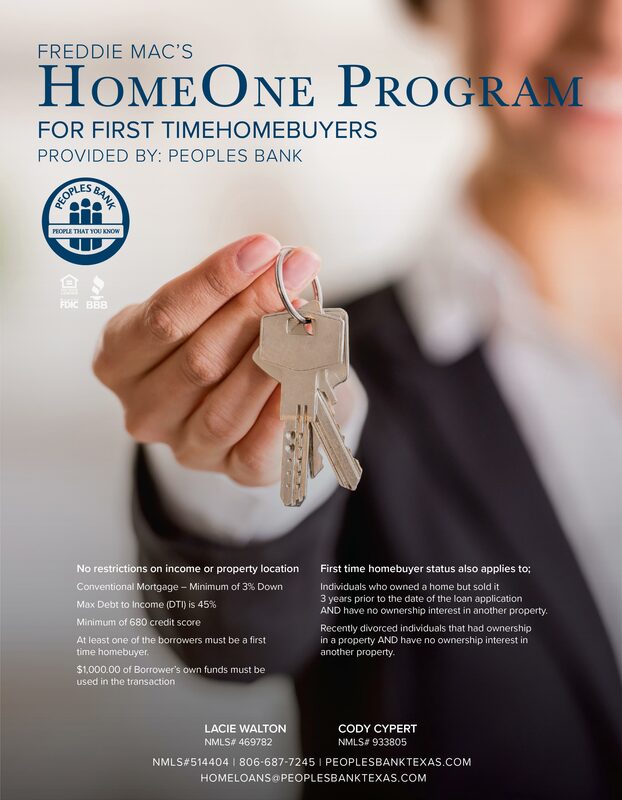 Peoples Bank Home Loan Center offers FREE Pre-Qualification to prospective home buyers. Peoples Bank offers you a complete mortgage loan service through our Home Loan Center. 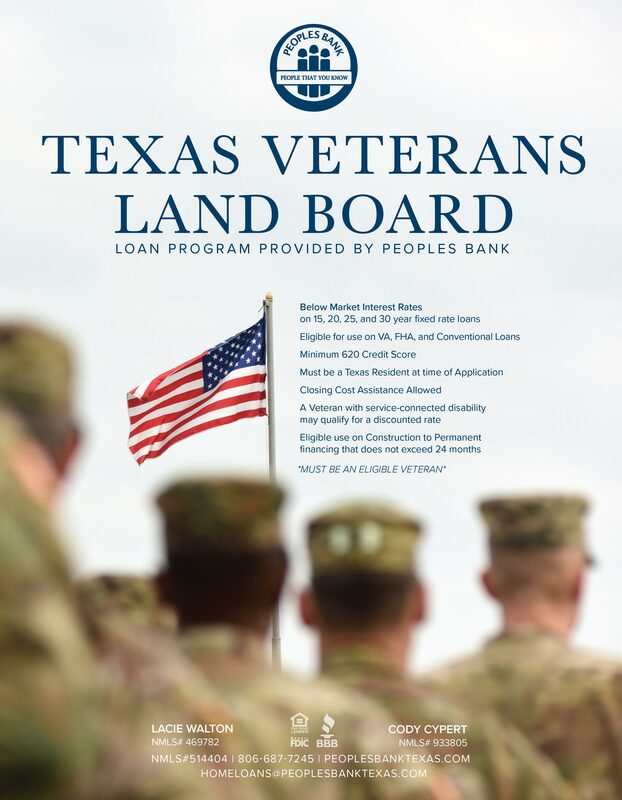 We offer FHA, VA, and conventional financing. Peoples Bank provides interim financing for construction, and our Home Loan Center provides permanent financing for your new home or refinancing for your present home. Our friendly and professional staff has years of Mortgage Loan experience to serve you. 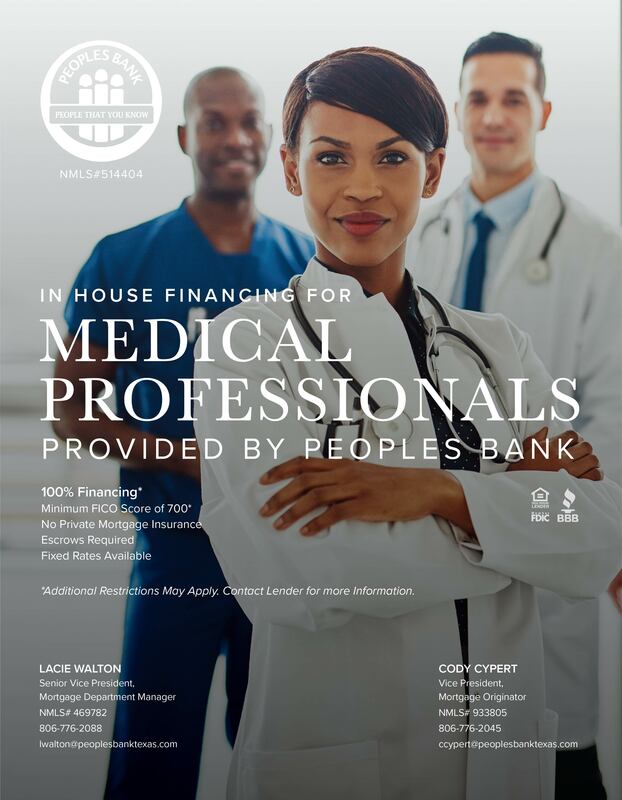 Lacie Walton has been in the mortgage business for over 25 years and is currently a Senior Vice President and Mortgage Department Manager at Peoples Bank Home Loan Center. She is very active with the West Texas Homebuilders Association and Lubbock Board of Realtors. She has a great reputation in this business and has a strong realtor and builder following. Lacie has been married to Mike Walton for over 19 years and they have one daughter, Carley. Lacie was raised in Lubbock and graduated from Frenship High School and Texas Tech University. She is active in her church at Wolfforth United Methodist Church. She loves to read, travel and spend time with her family. Some of her favorite vacation spots include Colorado and Florida. Lacie is an avid Red Raider fan and loves animals. A fun fact about her is that she can eat icing by the container. Cody Cypert has been in the mortgage business for over 18 years and is currently a Vice President and mortgage originator at Peoples Bank Home Loan Center. He has experience in several mortgage areas, including underwriting. Cody is a certified Direct Endorsement Underwriter with FHA and is a certified Staff Appraisal Reviewer with VA. Cody is very passionate about helping others buy their dream home or refinance existing loans. Cody, a native of Haskell, Texas, married Breann over 15 years ago and they have two children, Averie and Mason. He is a member of the Monterey Church of Christ. Cody enjoys watching his kids play sports, hunting, golfing, riding ATVs and drag racing. He loves to eat Mexican food and Seafood. Peoples Bank Home Loan Center would be honored to help you turn your dream into reality when purchasing your new home. We understand that buying a home may be your largest financial decision you’ve made, so it is important to know what steps to take and what you should expect. Allow you to preview available homes that suite your needs, which you’ve defined. Negotiate the best deal for you. 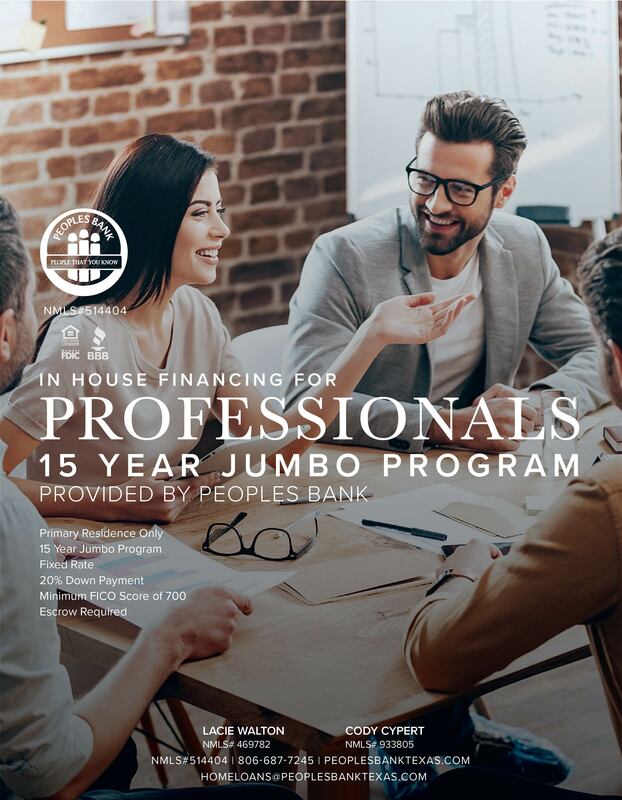 If you have a Pre-Qualification letter from Peoples Bank, your Realtor will be able to present you as a qualified borrower. What to expect from Peoples Bank Home Loan Center? Assist you in selecting the best loan to meet your personal goals, which can save you thousands of dollars in the years ahead. Communicate with you and keep you informed of your loan status throughout the entire process. Provide the best rates and fees possible. Visit with lender on process of loan. Provide basic info to review credit and discuss income/assets for loan program and amount you can qualify for. A credit report will be pulled and reviewed and potentially a pre-qualification (PQ) letter is prepared upon request. You should also begin gathering all supporting items that will be requested by the lender later in the process. (These items include but not limited to: last 2 years tax returns, W-2s, 30 day paystubs, last 2 months bank statements, photo id and proof of social security number) This PQ will be good for 90 days. You and your Realtor will meet regularly until you find your dream home and make an offer. Upon acceptance of that offer you will have a home inspection completed during your option period of the contract. You will either meet in person with your lender or sign electronically the required disclosures upon receipt of an executed contract. At this time you should have all your requested documentation and provide it to your lender after signing these initial disclosures; If not, this could cause delays. The lender will order title, insurance, verifications, appraisal and survey from various service providers in the loan process. Additional items are sometimes requested upon review of documents as they are received. Upon receipt of all items the file is submitted to an underwriter. This is the day you sign your final documents and all legal transfer documents for the house to become yours. The lender will fund the loan upon receipt of signed documents. If a refinance, a 3 day wait period is required before funding. Peoples Bank Home Loan Center would like to welcome you to visit our location at 5820 82nd Street in Lubbock. Our lobby is open from 9:00AM-4:00PM Monday thru Friday. 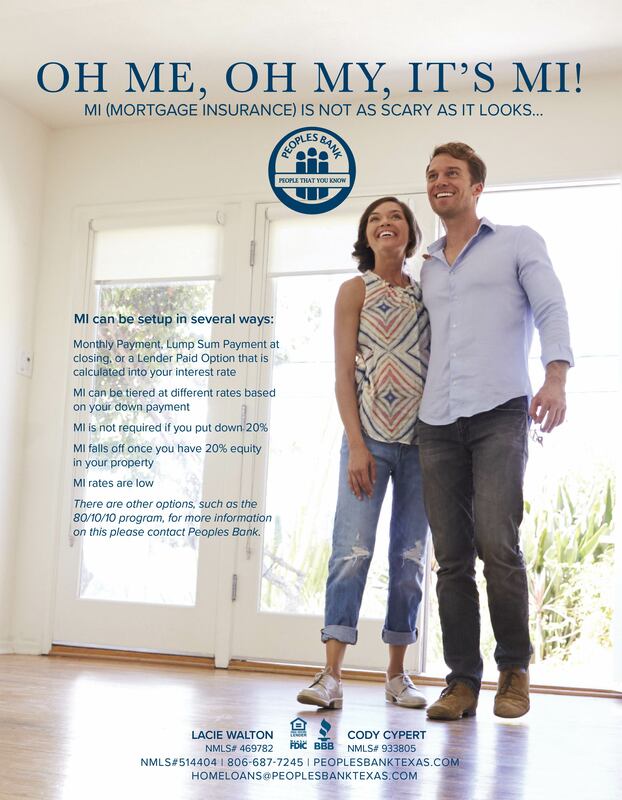 If you are not available to meet during those times, please contact the office at 806-472-4439 to schedule an appointment with one of our mortgage experts. For other questions, click here to get in touch.